“One” is not the loneliest number when it comes to one-ingredient meals that go a very long way towards reducing the 788,600 tonnes of food waste generated each year in Singapore – daily, that translates to the weight of 108 fully loaded double decker buses. Just a single act of changing the way you cook at home can bring down how much unfinished food is collectively tossed down the chute everyday. According to acclaimed Singaporean chef Eric Low (Chef E), taking on the challenge of getting creative with one ingredient means one package or one big serving of a meat, vegetable or carbohydrate can be stretched across a few meals without inciting yawns at the dinner table. Chef E’s recipe set for roast chicken with gravy, curry chicken and steamed lotus root with chicken feet is just one prime example of how a bird in hand is worth several dishes in the tummy! Chef E also suggests learning to love your leftovers – instead of casting them away, freeze them into usable portions, then dream up delicious side dishes, sauces and soups with these would-be scraps. Think vegetable stalks for soup stocks, rice for congee and crackers for pastry crusts. Get inspired directly from the source by attending Chef E’s cooking demos at TANGS Orchard. 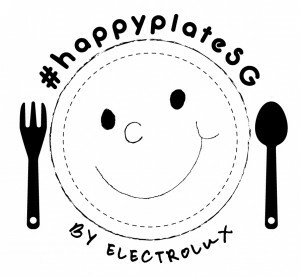 Share how you’re taking steps to reducing waste by joining Electrolux’s #HappyPlateSG movement in Singapore. Just snap a shot of your empty (finished food) plate, Instagram or upload it via HappyPlate.sg with the hashtag #happyplatesg. For every three #HappyPlateSG hashtags from now till 22 November, Electrolux will donate a Happy Food Bundle to a family in need via the Food Bank Singapore.